This page spotlights one of James' past performances. Visit the current project page for ongoing and upcoming projects! Monday, June 17, 2002, 7:30 p.m.
All proceeds benefit The Actors’ Fund, which assists entertainment professionals throughout the country in their time of need. 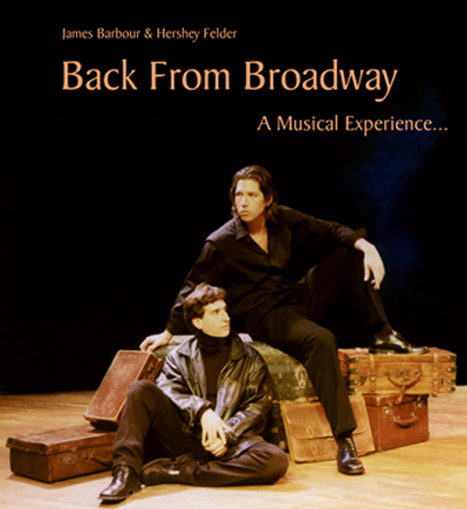 Back from Broadway, starring James Barbour and Hershey Felder, features behind-the-scenes theater stories, songs from classic Broadway shows, and selections from the works of Chopin and George Gershwin. This excellent show runs approximately 90 minutes with no intermission. Don't miss it!